The Dark Side of Being Single: A Single Girl Kills Her Own Spiders! Recently, I’ve noticed an interesting trend on Facebook. No, it has nothing to do with fashion, or food. And it’s not a disgusting YouTube video; it’s the posting of spiders under glass. At first when I saw the pictures I thought they were some sort of art project or pet that a child had found and decided to call “Herby”. But it turns out that the spiders were not placed under a glass by any children but by their mothers. Yes, that’s right, married women putting spiders under drinking glasses, keeping them in a prison of sorts, until their valiant husbands come home and have the honor of squashing the arachnoid. 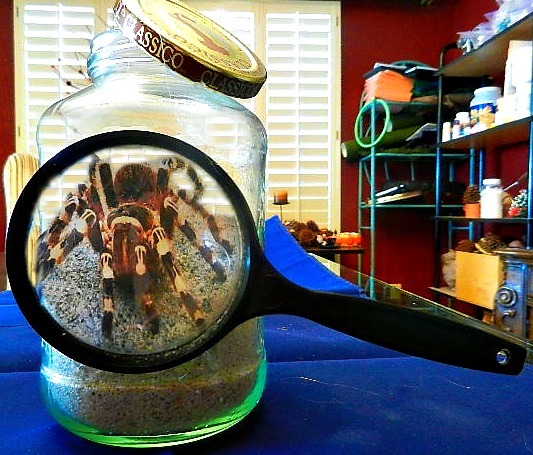 You are probably thinking these spiders are large, and maybe a tarantula that would give Godzilla a run for his money! In fact these creepy crawly creatures seemed no larger than a dime in the pictures. Yes, I know some people have arachnophobia, the fear of spiders, but what does a single girl who lives alone do when she finds a spider? Well, I can’t really put the spider under glass and wait for guy to come kill it! Come on now! I have to be reasonable! Suffocation is a horrible and slow way to die, even for a spider. He was large and from what I remember quite hairy and yes the size of a Tarantula! As soon as I saw him I did the only thing that any other single girl or married one for that matter would do: SCREAM! I quickly realized, I lived alone, which made me cry. Meanwhile “Herby” continued to sit in the middle of the dinning room floor and stair at me with his one million eyes. We had a stair down of sorts and I really didn’t know what to do? I couldn’t figure out if “Herby” was an actual pet? I was newly divorced, and on my own. No husband around to do the dead of murdering Herby. For a few moments I thought about what would happen if my ex husband was around. And then I remembered the time when we were still married, and there was a tiny field mouse living in our garage. I ended up placing several boxes of mousetraps in the garage, and eventually the little critter got stuck in the glue. My ex husband was so terrified of the little mouse, that he was unable to that pick up the box and throw it away. Nope, that ended up being my job! I was the mouse murderer. To this day, I remember seeing the little guy’s eyes bugging out of his head and his ears perked up while he tried to squirm his way out from the glue that trapped him. As I walked closer to “Herby” he seemed to just sit there and stare at me probably calculating his escape. Then suddenly he moved towards me, and I jumped back and again screamed! I did the only thing that I could think of, and that was to take off my Dansco nursing clog and throw it at him. The first time I missed, but on the second shot, I noticed blood, yes actual blood splattered from “Herby’s” body! I waited a couple of minutes before I had the courage to lift up my shoe, and make sure that “Herby” was really dead! As I picked up the shoe half of “Herby” lay there squashed in a small pool of blood, while the other half was still stuck to my Dansco nursing clog. I felt triumphant to kill my own spider. Almost like I had crossed some sort of right of passage, and an opening to what being single was going to be like. Cleaning him off of my floor and shoe was another story. But who else was going to do it? I finally got the courage to clean up the crime scene, and accompany “Herby” to his final resting place, the garbage can. The next day I was walking through the neighborhood and noticed a flier that said: “Lost tarantula” with a phone number and no reward being offered. When I see the Facebook posts about spiders, I’m really tempted to write: “just kill it” or “No one cares!” But I grit my teeth and refrain, and think: maybe that’s why those girls are married, they need an exterminator.